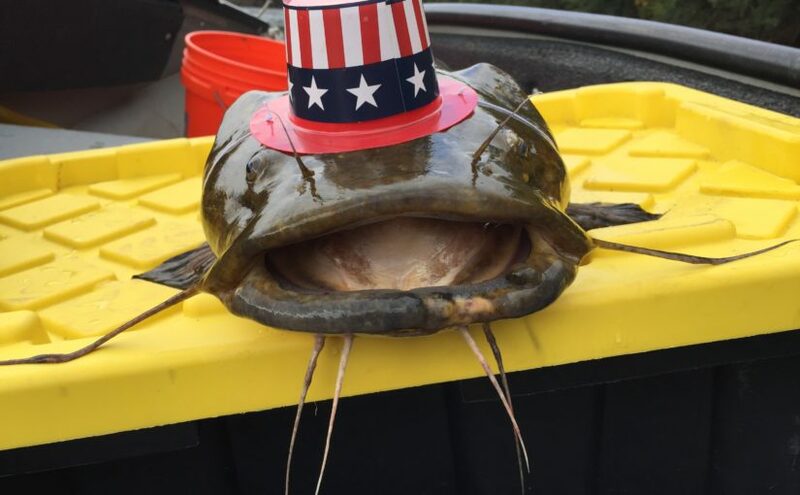 Posted on November 4, 2018 Leave a comment on Make Catfish Great Again! 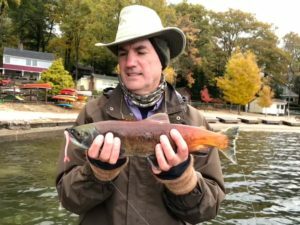 Kokanee were a fish I had never caught, yet I had pondered for years. 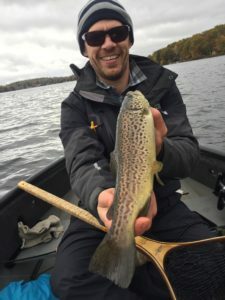 With no waters close by and only a few within a day’s drive, targeting this fish was a proposition full of questions and concerns. Most of these questions would have to be answered on the water, but the first had to be answered just to get the ball rolling. Where and when to go? 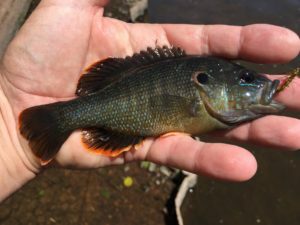 My friend and I chose a stocked lake. With little or no natural reproduction in this lake, fishing for spawners would have no impact on a future year class. With ethics out of the way, this would be an autumn trip for sure. We were not interested in eating them, so the condition of the meat was not a factor. The sight fishing aspect and spawning colors are awesome. The next question was more of a concern. 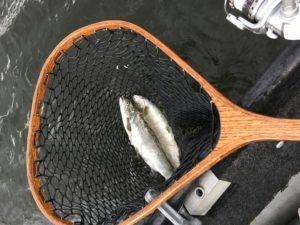 Would we catch anything if this kokanee thing was a bust? We were heading into unknown waters – quite literally. Neither of us had fished anywhere near this lake before. Fishing is never a lock. Some pre-trip research on the fishing options in that area allowed us to drive through the night and arrive at dawn with confidence high. 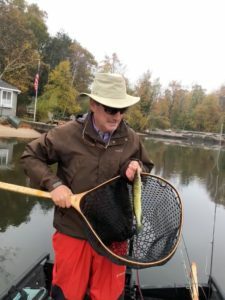 Like many fishing trips, it started with a chain pickerel. The Northkill boat net seems like overkill, but i did not want to chance losing my fly to sharp teeth. 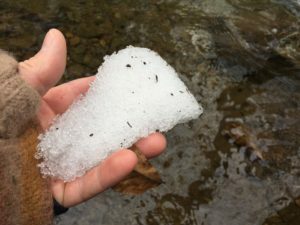 Would we succeed in catching a kokanee? Hell yeah, we did! It did not take us long to locate fish. Once we found them, we were on the salmon board within minutes. My fishing partner broke the salmon ice with his first Kokanee on the fly. 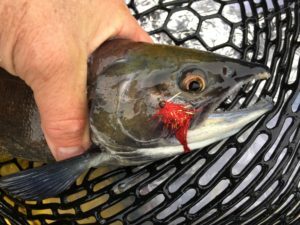 The next question: do they actually bite the fly or are we just “flossing”? They are filter feeders, after all. Add in the fact that they cease feeding when their focus turns to spawning. I had some doubt. I was going to have to see it myself. The answer was as clear as the water. They didn’t hit every cast. In fact, they didn’t hit the majority of the presentations. When they did bite, it was obvious that they meant it. 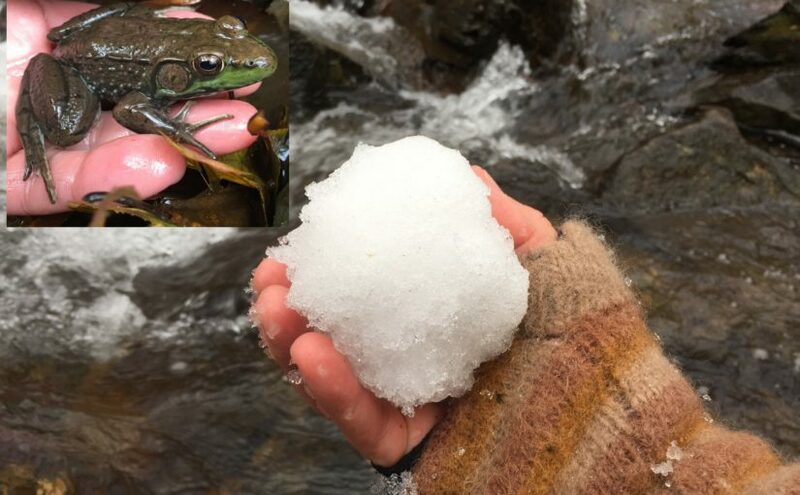 Whether it was predatory reflex or protecting their redds or whatever, they absolutely did strike our offerings. This hen was next to take a fly; this time mine. 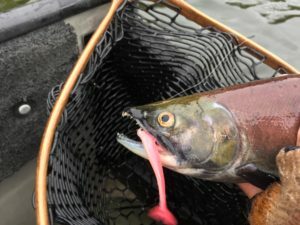 The Kokanee Salmon – Oncorhynchus nerka just became #19 on my 2018 Flyfishing List. 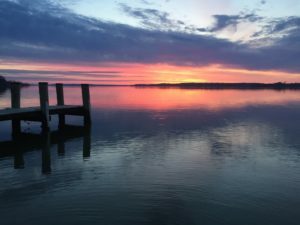 Questioning success: what do we do if we drive all this way and catch what we were looking for as soon as we start? Do we hammer the same nail all day? Do we call it early and jump right back in the car? As it turned out, we started with lemonade, it turned to lemons, and we turned it back into lemonade. We met our primary goals early, so when some jackass in an inflatable boat intolerably crowded our spot, we didn’t react negatively. We took this as a sign to move on and finish exploring the lake. 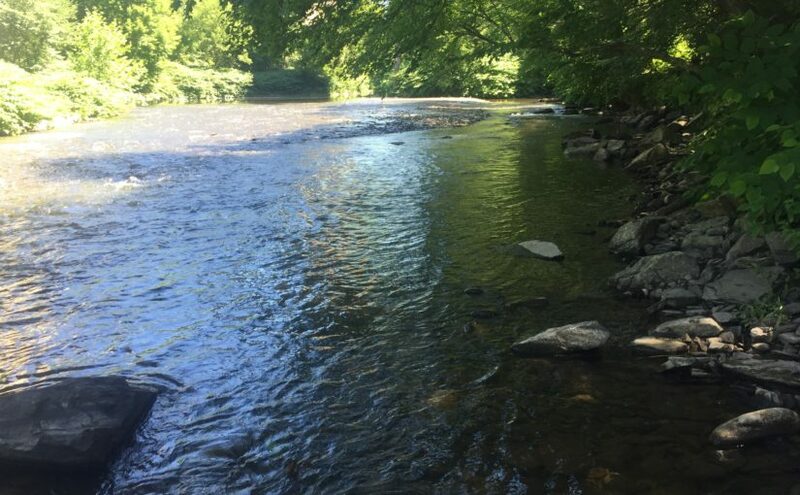 We broke out the Northkill Tackle spinning rods for efficiency, and covered some water. 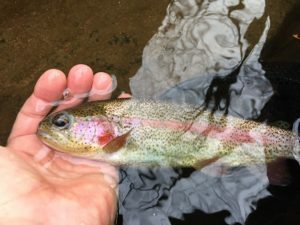 We found a solid population of brown and rainbow trout willing to take our lures. The trout would have been an acceptable safety net had the kokanee not come through. Nice to know for the future. 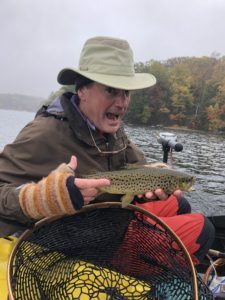 …and the trout eagerly obliged. Questioning some details: would any of my “go to” spinning tactics appeal to kokanee? Based on our morning observations, most would have fallen short. 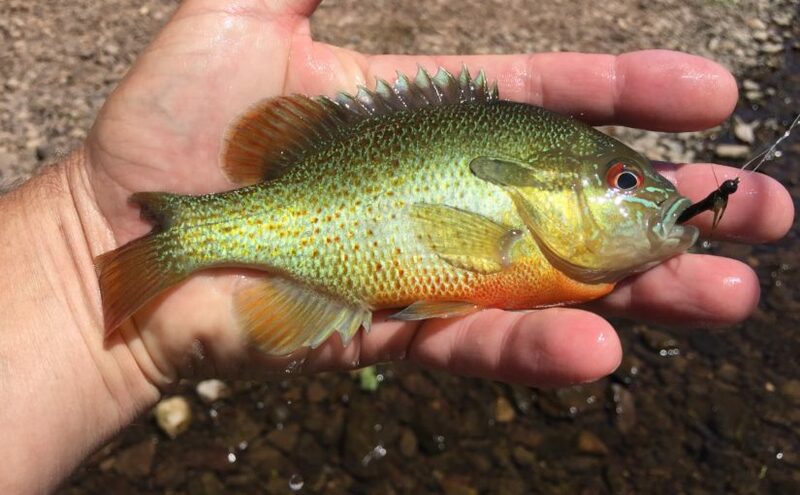 Brightly colored 2.8″ Hawg Shads did seem like a promising lure choice – and they were. The kokanee hit them quite well. 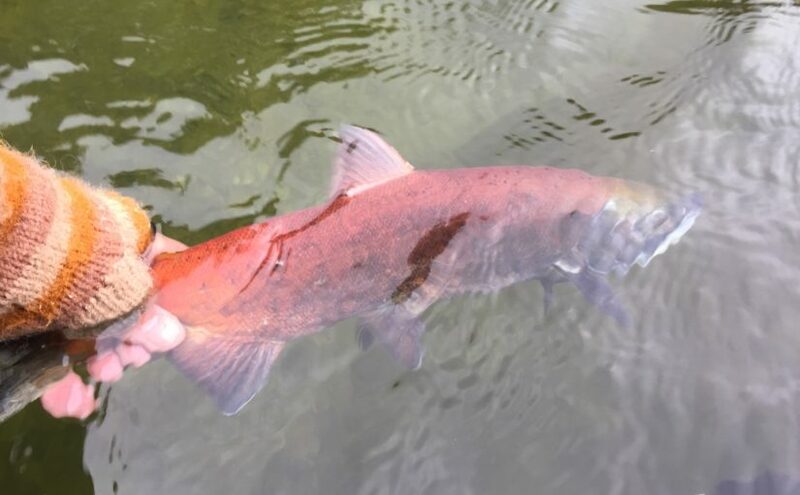 Hawg Shads never cease to amaze me with their multi-species versatility. To follow up on a hunch, we got back on the Kokes (we can call them that now that we’ve caught them). Suspicion confirmed. Kokanee will hit a well presented Hawg Shad with bad intentions. Look at those teeth! A #J304 Hawg Shad dangles from the upper jaw. Just how long was this day going to be? We assumed from the start it was going to be a long one. Logistics made that obvious. 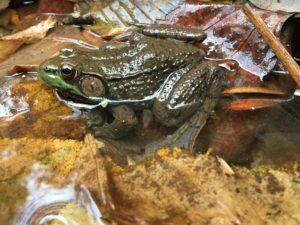 We had success on multiple species with multiple techniques under our belts. 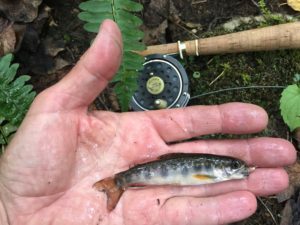 We fished kokanee, we fished trout, back to more kokes, and don’t forget that bonus chain pickerel; we left at the end of a very full day. 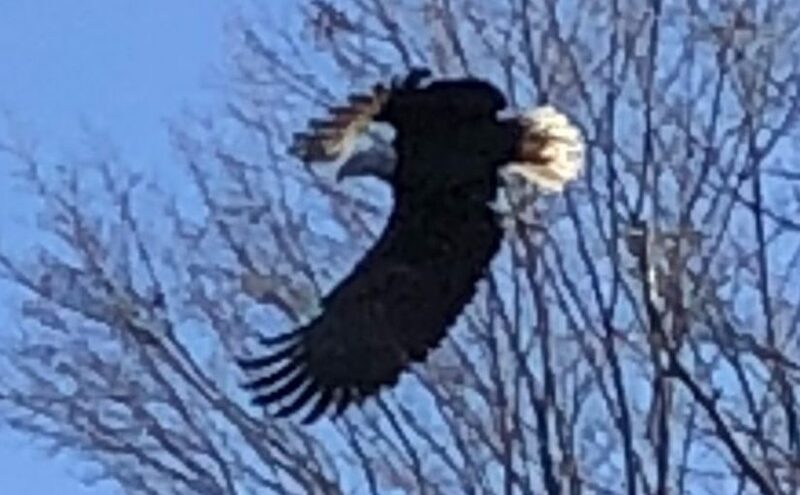 One last release and we walked away content. 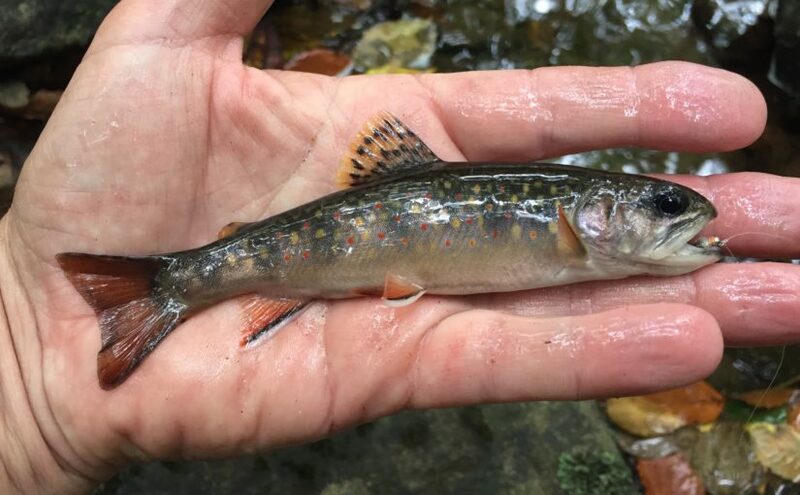 …brought a smattering of diminutive Salvelinus fontinalis. 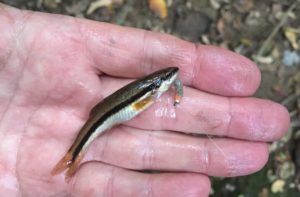 The surprise guest was this blacknose dace. 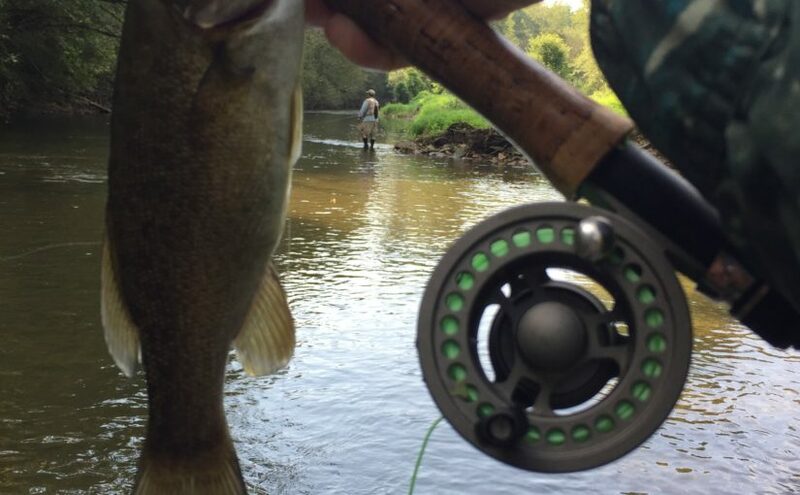 It became #18 on the flyfishing list. 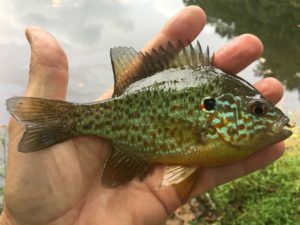 A bonus pumpkinseed from an adjacent pond added some more color to the day. Fast forward a few weeks from the time of the trip in the last post. 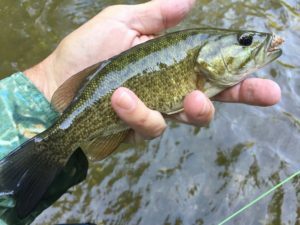 A return trip, this time with flyrod in hand, to that river yielded #17 on the flyrod list – Smallmouth Bass, Micropterus dolomieu, and lots of them. 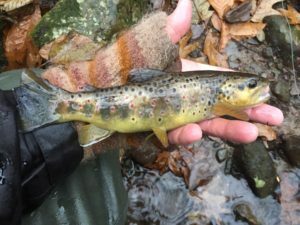 An unpredictable combination of destination and tackle choices lead to a delayed inclusion of this species on the 2018 fly fishing list. Better late than never. Better small than nonexistent. Unlike last time, I was not fishing solo. 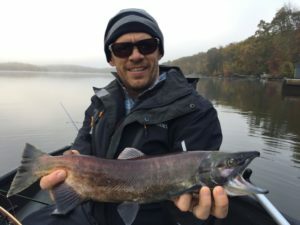 I met up with a long time fishing partner for this one. Like my last trip, the river had a “B” side. I wasn’t successful right out of the blocks this time. 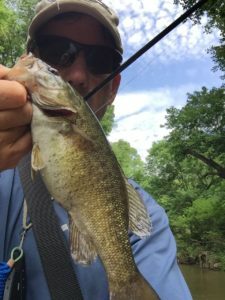 After half an hour or so, I had only landed one tiny smallie on one of my trusty streamers. I crossed paths with my buddy. He stared at me in disbelief when I told him of my sparse results. He said, “I’ve got at least six so far.” That second rod just shortened the learning curve for me. Back in the flybox went my streamer. Out came a woolybugger and a Clouser crayfish for a tandem rig. It wasn’t exactly what my friend was using, but my combo was quite similar in appearance and productivity. By swinging tandem nymph rigs, we both ended the morning well into the double digits. 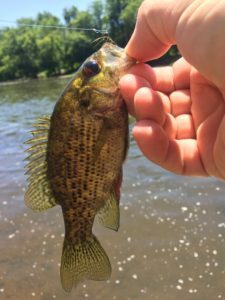 My friend even had a two species double with a smallmouth and a rockbass together on his rig. That change in tactics saved my day. Summer travel left me with a few hours to kill in a strange town. The logical thing to do was some fish prospecting. 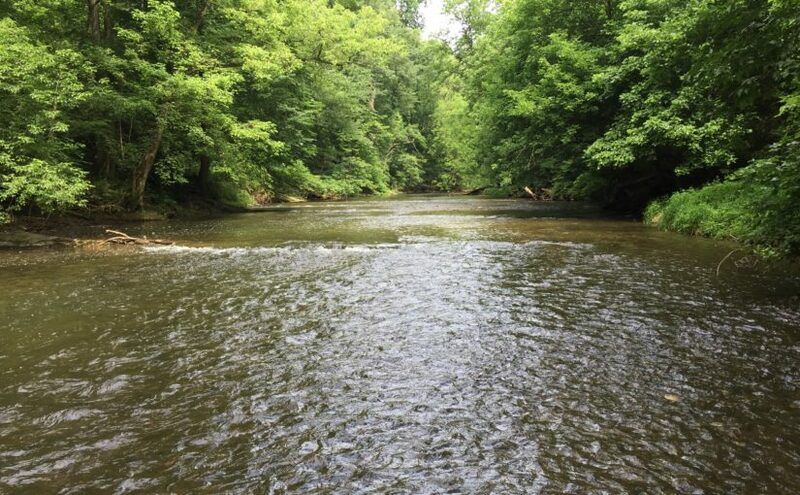 Small rivers with smallmouth bass seemed to be the most likely target in this region. Pre-trip planning gave me a couple waters and few access points to explore. 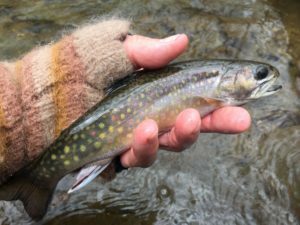 With ultralight in hand, I hit the water at mid-morning. 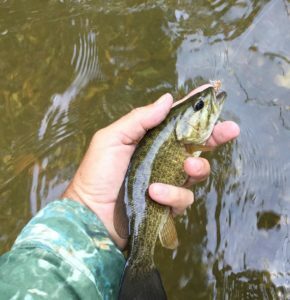 Within minutes I was into a scrappy little smallmouth. 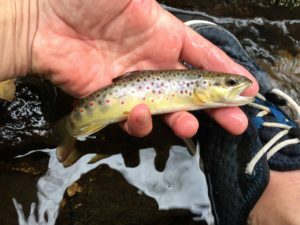 First river, first spot, first lure; it was all clicking. The action continued. They took a tiny jerkbait at almost every piece of cover or likely run. 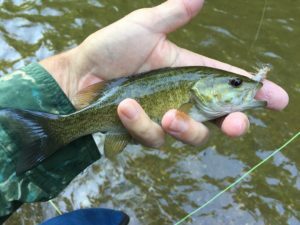 This stream seemed like a dense monoculture of Micropterus dolomieu. 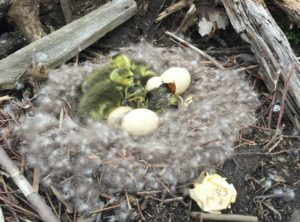 What they lacked in size, they made up for in cooperative spirit. My free time was running short. It was time to fish my way back to the car. Since I had just covered this water with the jerkbait, I thought a switch to an different lure might yield more results. An ultralight spinnerbait seemed like a promising choice. Right off the bat, I was catching fish on the new lure. There was one difference. 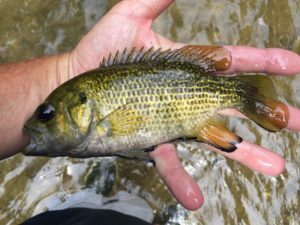 Now they were rockbass – exclusively rockbass. 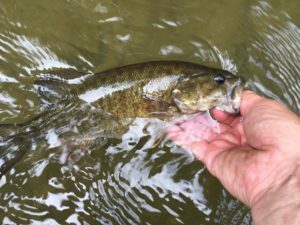 The same pools that just minutes ago seemed to only contain smallmouth now seemed like they only held rockbass. What was my takeaway here? Experimentation isn’t just for the desperate times. 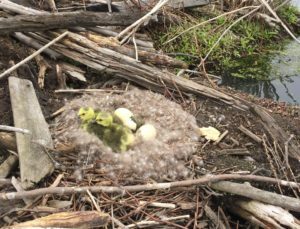 Sometimes, even when the fish are biting on plan A, there is something more to learn by trying a plan B. As a closer, I followed a hunch. 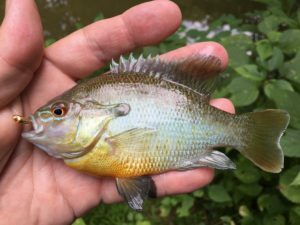 I switched to a micro-jig and plucked a couple redbreast sunfish from a slow pool upstream from the fast stretch I just fished. 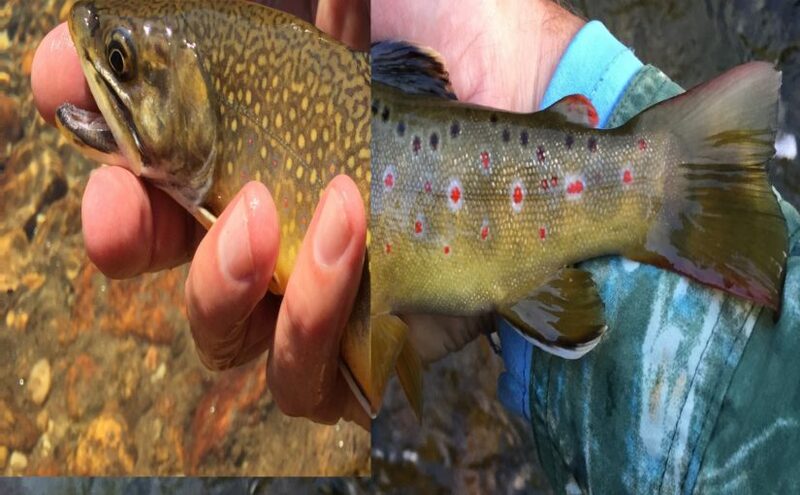 That was three species for a “small river slam” to finish the day. 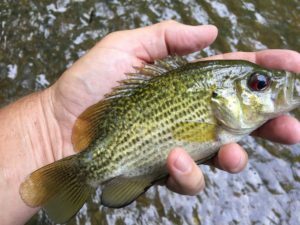 The fish are the obvious part, but it’s often the bits and pieces on the periphery that make the lasting memories. 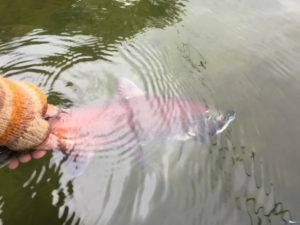 The otters on the ice at the beginning of a nearly fishless day, or the coyote pups resting on the mud flat while I stalked carp – these are the mental trophies that have stood the test of time. Fishing was just the vehicle that put me in position to see those things. This is an encounter from last week that I will remember for a long time. 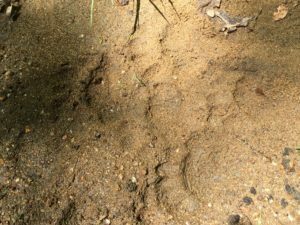 Maybe bear tracks are not as exciting as seeing the whole bear, but still cool nonetheless. 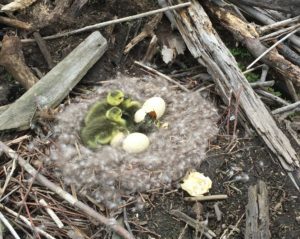 Watching a gosling hatch overshaddowed the fishing on this day. 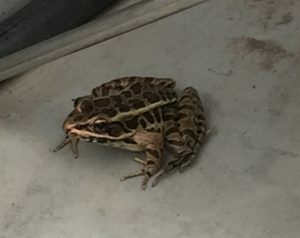 I fondly remember the pickerel frog that jumped into the boat at the ramp. Equally curious is how he stealthily disappeared after a couple hours onboard. Many months after this trip, the brilliant red and orange sunrise is the memorable part of the day. The rest of the day was just fishing. 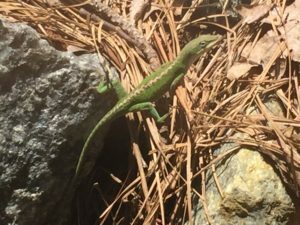 Watching an anole in the pine straw rivaled the reward of casting to spotted bass in the rip rap – for a little while anyway. Sometimes you have your cake and eat it too. 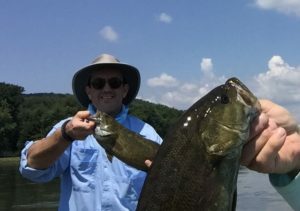 I’ve been summer smallmouth fishing with my longest tenured fishing partner for over 35 years. Those trips included mink, fossils, and accidental dunkings. We also caught a lot of fish along the way.